Capital planning is a key element to the future success of the Springfield Park District. Outdated parks and facilities can limit our organization's delivery of products and services. Few, if any, of our facilities are exempt from significant physical renovations, improvements or new construction required to meet their functional expectations. Major renovations and new construction at the Springfield Park District fall into the category of capital improvements, as do substantial repairs and equipment replacement, which would not be included in our normal maintenance and repair budget. Planning for capital development and improvement at the Springfield Park District can be a complex combination of demands, financing and the long range plans for the District. The Park District has prepared a capital plan that establishes the priority projects for the budget cycle. Input to the plan includes projects that were not funded in the last budget cycle and are still a priority to the organization, plus new requests for projects that are physically and financially feasible. Input and requests come from a variety of areas within the District, including the Recreation Department, Parks Department, Finance Department, Marketing Department and the Athletic Associations. The number of worthy projects generally far exceeds available funds. Therefore, funding priorities become an important part to the capital planning process. The Springfield Park District utilizes the following criteria to assist in determining the priority of a requested project. Proposals will be received at the office of the Springfield Park District, 2500 South 11th Street, in the Bunn Park Central Office, until 4:00 p.m. on Friday July 6, 2018 for an Accessible Playground System for Douglas Park. The Board of Trustees of the Springfield Park District reserves the right to waive or not to waive any irregularities in the proposals and to reject any or all proposals and to accept any proposal deemed most advantageous to the District. The Springfield Park District is an Equal Opportunity Employer. "Minority" business firms are encouraged to submit proposals for this project. 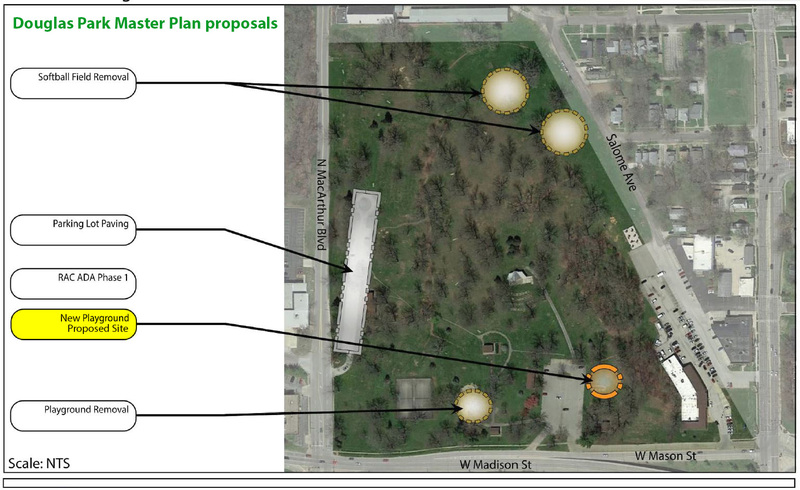 The image below is from the 2018-2022 Springfield Park District Master Plan - Douglas Park improvement proposals. The area highlighted in yellow identifies the 75' x 75' area designated for the REQUEST FOR PROPOSAL FOR ACCESSIBLE PLAYGROUND SYSTEM. Request for Proposal for new site/system does not encompass the removal of the old equipment at the original system site. Click Here to Download a PDF of the Full Scope and Submission Requirements for the Accessible Playground System RFP in Douglas Park.